I'd seen this infuser on eBay for what I thought was too much moolah, but when the price came way down, to $1.49, I bought one. This comes in several pastel colors, and I preferred the yellow-green. Someone in marketing apparently thinks it is a real draw to have a tea infuser shaped like a tadpole. Wouldn't you like to have been in on that discussion! And so, no surprise, there was some spillage of tea leaves into the cup, but I've actually been developing my avoiding-drinking-the-tea-leaves skills, so that didn't worry me. What does worry me is the realization that I just plunged an unmarked piece of Chinese plastic into a cup of boiling water, and over the long term that might not be such a good thing. 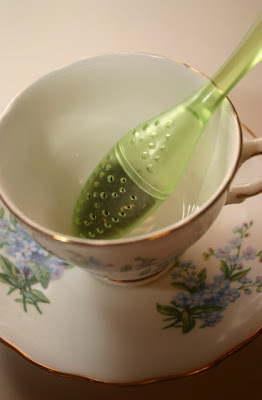 But at least I can say I've tried the Tadpole Spoon with Tea Strainer Infuser, and I have a nice little collectible for the tea cabinet. 365 things about tea ... and a giveaway! 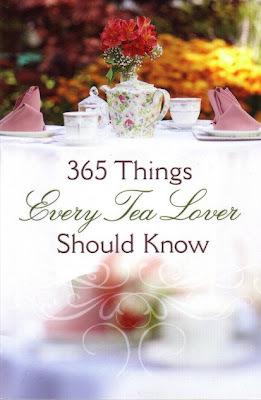 As soon as I saw the title of this book I knew I wanted it, and the folks at Harvest House Publishers were kind enough to send a review copy of "365 Things Every Tea Lover Should Know." It's a tiny book - just 4x6 inches, the size of a large index card - but it is packed with tea lore, trivia, quotes and even a few recipes. 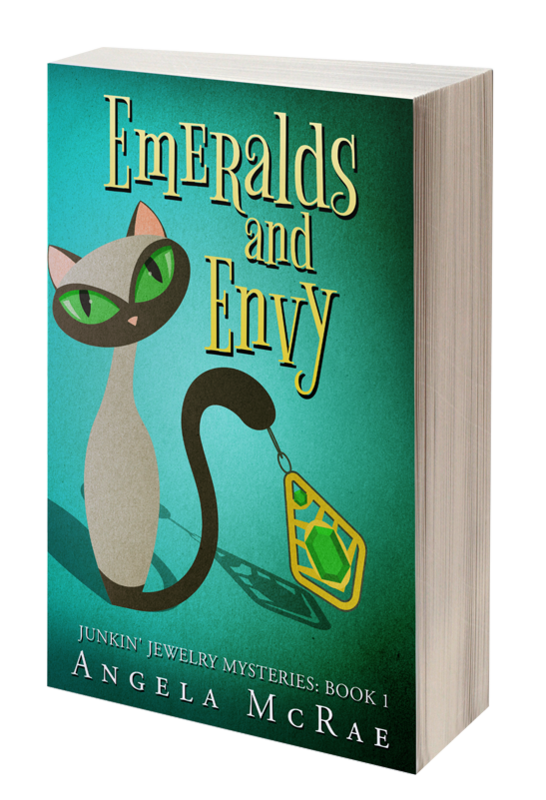 The size also makes me think this $5.99 book would be a great stocking stuffer or tea party favor. And while any tea lover would enjoy this book, I think it will prove especially helpful to those of us who occasionally write or speak about tea. "When brewing rosehips tea using the whole rosehips, steep for ten minutes." 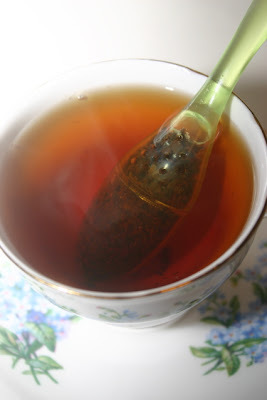 "Rooibos tea is said to help relieve insomnia." And keeps that palace of the soul serene." - Edmund Waller, "Of Tea"
And while they're not out yet, I was delighted to see in their fall catalog that Harvest House has a new Emilie Barnes book AND a new children's tea party book set for release in June. When my package arrived the other day, it also included a copy of the wonderful Alda Ellis book "The Gentle Art of Hospitality," which I wrote about on Oct. 30, 2007. Since I already have a copy, I'm going to give away this brand spanking new one. Just leave a comment to any post between now and midnight Saturday, and I'll announce the winner on Monday. How's that! Do you have a favorite fruit flavor of tea? I seem to this year: Mango. 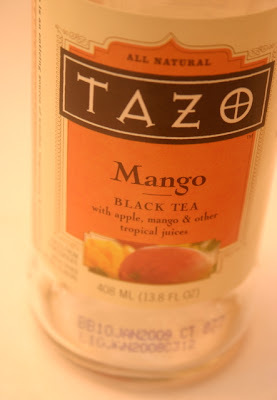 When I stop by the grocery store on the way home from work, I'm likely to grab a bottle of Tazo Mango Tea. 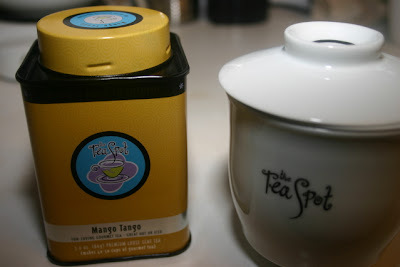 And over the weekend, I was at a Whole Foods in Atlanta (LOVE that place) and came across the Tea Spot's Mango Tango. 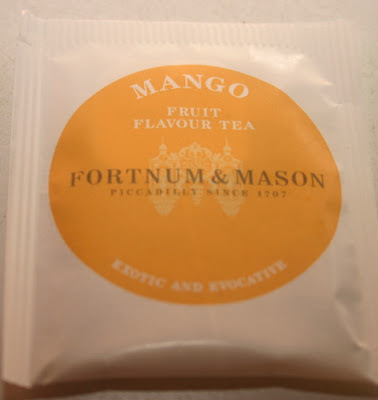 It was on sale for just $4.49, which I thought was a great price for a tin of tea, but best of all, it has a nice, full, mango flavor. On the way home with the tea, it occurred to me this vendor was one I'd visited at last year's World Tea Expo, and they had even given me this neat little infuser cup with their logo, so naturally I had to use that in making the tea. Did you know the World Tea Expo is coming up this week? Alas, it's in Las Vegas this year, not Atlanta, so I won't be attending. 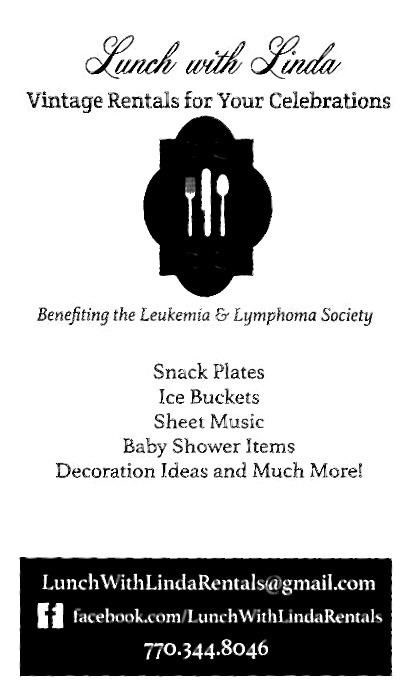 But if you'd like to see some of the new products that will be shown there, go here. And if you're going to the Expo yourself this year, by all means, send us some reports! I regularly come across articles featuring or just mentioning tea in the many magazines I read each month. I don't want to devote an entire blog post to each such "sighting," so I decided I'll start this running list (it's now at top right) to give you a blurb about the articles I've come across. I hope you find it helpful! 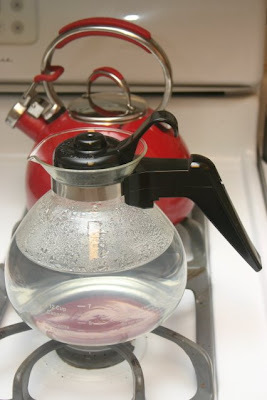 If you're a tea drinker, you know that a good tea kettle is a crucial piece of kitchen equipment. 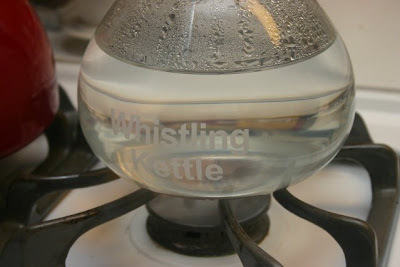 I've had several of them in the past few years, but today I'm using the new Whistling Kettle I found at a local Kmart over the weekend for just $9.99. 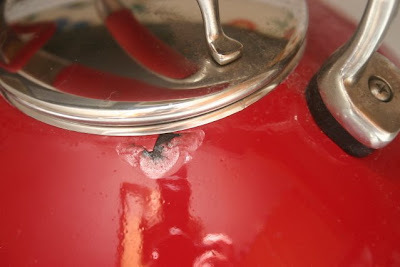 I'd had a glass kettle before, but when it cracked after only about a year, I decided I was not going to purchase that type of kettle again. I did, however, miss the luxury of being able see the water start to bubble. When I got married and we bought a house with a red kitchen, I decided to furnish it with red appliances and even got the red tea kettle at back, a kettle from the famous Kitchenaid line. 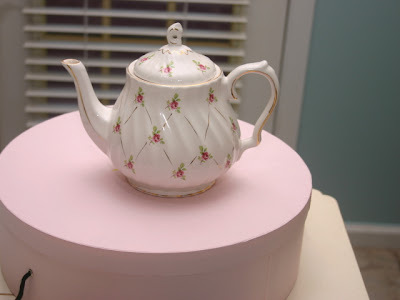 Of the tea kettles I've used in recent years, I would have to say my favorite was the Old Country Roses enamel tea kettle, followed by the glass tea kettle, until it cracked. 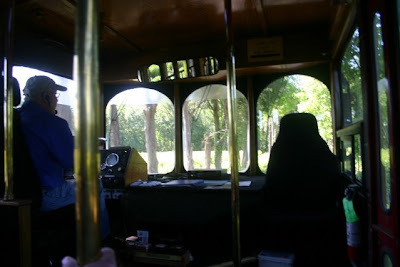 But now I'm over that fear of glass, I think, and willing to give it a whirl again. I'd never buy Kitchenaid again, but I *would* be willing to try just about any other model of stovetop tea kettle. Recommendations, anyone? For today, I am just happy to have the clean, simple new Whistling Kettle, and ugly old Mr. Kitchenaid is headed to the yard sale bin! With the Memorial Day weekend coming up, I know I'll be making a pitcher or two of iced tea to enjoy over the next few days. And to stir the sweetener into that tea (if needed), I'll be using some new teaspoons I found on eBay courtesy of a b'day eBay gift card from DH. 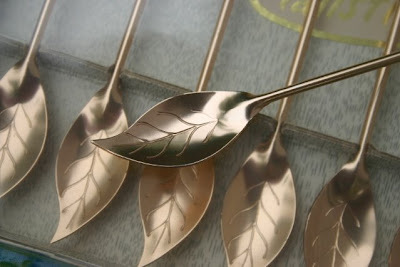 I seem to have been talking about the tea leaf every day this week, but today's tea leaf is actually the shape of the bowl of these teaspoons. 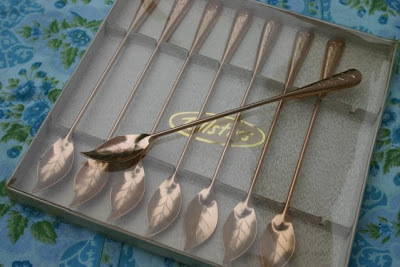 These vintage aluminum teaspoons, still in the original box, are called Tallstirs. I wanted the gold ones, but if you're into bright, retro kitchen colors, you might like to know these also come in the bright turquoise, pink and other colors that match the aluminum tumblers that were once so popular. 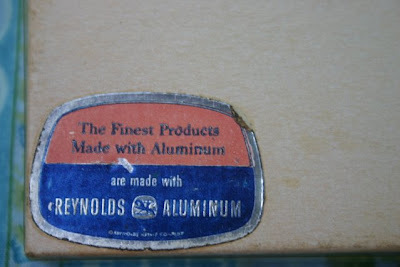 New tea accoutrements are always welcome at this house, but I especially like to find new "old" accoutrements, and I love the label on the back of this box: "The Finest Products Made With Aluminum Are Made With Reynolds Aluminum." However you take your tea this weekend, and whatever you choose to stir it with, I wish you all a wonderful, relaxing Memorial Day! 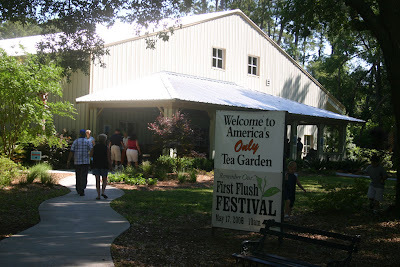 Finding tea in Summerville, S.C. Sometimes, I find "tea connections" where I least expect them, and it happened again last week. As soon as we got to South Carolina, DH and I headed to Summerville so I could re-visit the amazing quilt store People, Places & Quilts. My dear friend Kathy and I have both adored this store since we discovered it on a memorable girlfriend getaway a few years ago. We spent several days visiting every quilt and fabric shop in Savannah, Charleston, Summerville, Mt. 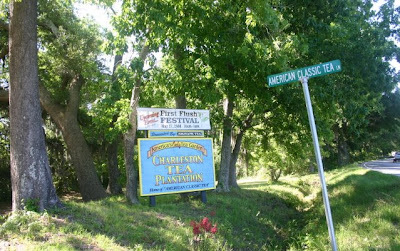 Pleasant and Beaufort, as I recall, but the PPQ shop in Summerville was the largest, most well-stocked quilt store either of us had ever visited at that time, and we both went a little nuts buying patterns and fabric. 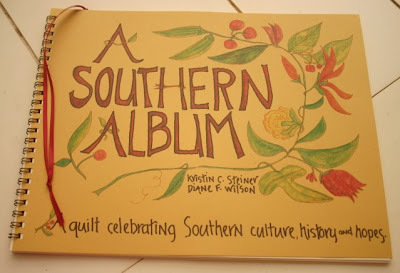 This time, my great find was the book "A Southern Album" by Kristin C. Steiner and Diane F. Wilson. 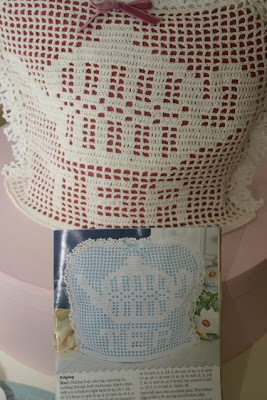 A few baskets of this folksy-looking, wire-bound book appeared around the shop, one of them in front of the stitched-up quilt (WHY didn't I snap a photo? 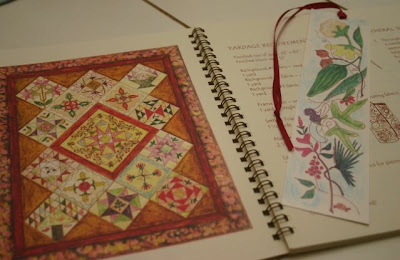 ), which featured some lovely traditional-style blocks and some nice applique work. Since I learned to applique last year, I find myself very drawn to appliqued quilts. This book itself is very nicely produced, and there is even a matching bookmark that comes with it. 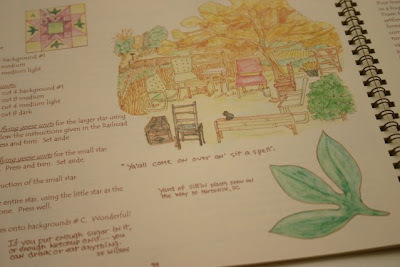 I was flipping through noting it included the stories behind the quilt block patterns, such as Cotton Boll, Carolina Lily and Turkey Tracks in Rice Fields. The names alone were quite intriguing! And then I saw the pattern that told me this book would be the perfect souvenir from Summerville: Sweet Tea Stars. 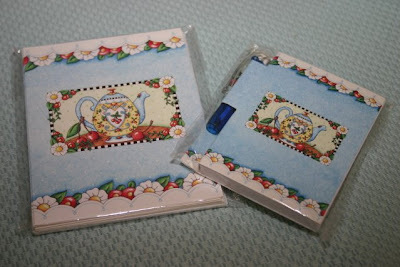 Along with a "sweet" reminiscence about this "divine nectar fit for queens," there are instructions for a pieced and appliqued block and a pattern for tea leaves to applique on the block. If you're a tea-loving quilter from the South, or simply have an appreciation for the South, I think you would greatly enjoy reading this lovely book. You can find out more here by clicking on Patterns and Publications. 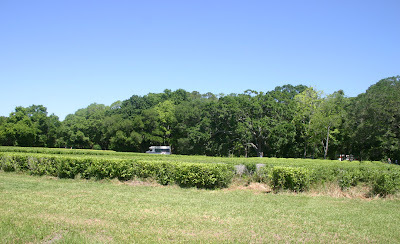 During the Charleston Tea Plantation trolley tour, our guide told us the plantation makes only enough of its American Classic Tea to serve Charleston and the local market. Fortunately for out-of-town tea lovers, some of that tea ends up in the gift shop, and I was delighted to be able to bring some home to enjoy and to share with friends. I also like to collect any mug with a tea company logo on it, and this cute china teaspoon showing a flowering tea plant seemed destined for my tea cabinet. 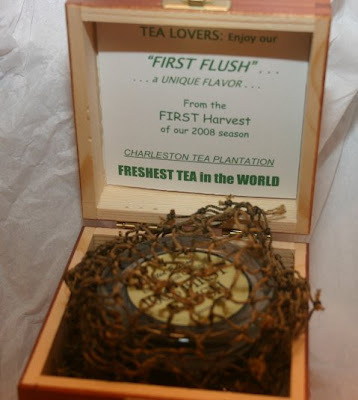 My favorite souvenir is this keepsake wooden chest of First Flush Tea (the glass jar is shown in the top photo). I don't guess I've ever had tea I knew for certain was fresh from the field, and the pure, clean taste of this was very refreshing. 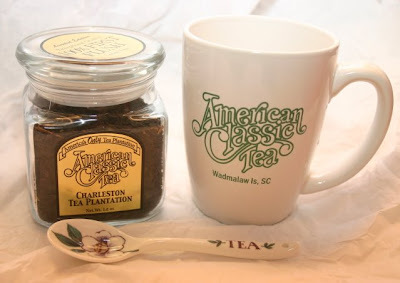 If you want to order some American Classic Tea for yourself, it's available on the Charleston Tea Plantation web site. I am a good gift shop's dream shopper, because I'm a sucker for all the stuff they carry. I got a couple of boxes of the silk tea bags, a bar of soap made with American Classic Tea (I forgot to photograph it before I gave it to a friend), some postcards (I particularly liked the closeup of the flowering tea plant), and a DVD. After the Charleston Tea Plantation trolley tour, our next stop was "the plant," which some clever soul decided visitors should enter through the gift shop. (It would have taken the Green Giant to keep me *away* from the gift shop, but I digress.) After spotting a number of nice souvenirs that would be going home with me, DH and I got in line for the tour and were among the 28 in this group. It was a very orderly tour, and I was pleased to see there were a number of things in place to make the experience more enjoyable for tourists. For example, a large mirror-like piece (I'm betting it wasn't a real mirror) was hanging over the processing machinery so visitors could see it at work. You can see in the top photo here that the mirror is suspended from the ceiling of the facility. 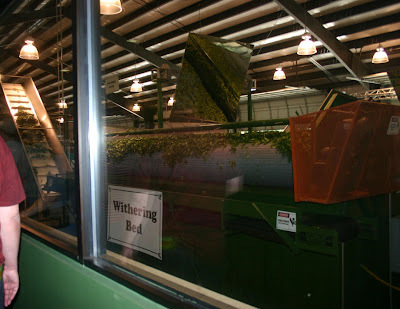 The withering bed, shown in these two photos, can hold 5,000 pounds of tea leaves and is where the leaves rest for 18 hours. During this time, about 12 percent of the moisture is removed. 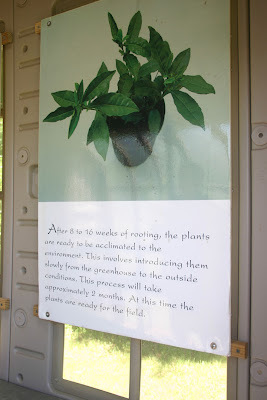 A small greenhouse was set up for the festival, and it contained some nice posters outlining the process by which they clone new tea plants. This clever sign emphasizes the fact you'll have to travel a few miles to find the next closest tea plantation. In the background are musicians who performed at the festival. And finally, one last look at those vast rows of tea. 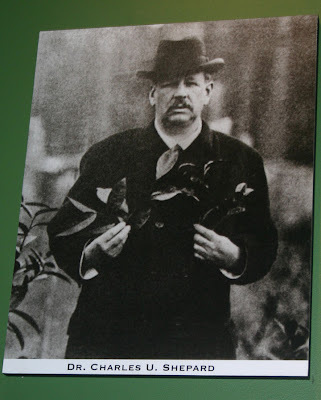 Can you see why I am now obsessed with finding a tea plant of my own to grow? I was hoping they'd have some for sale so I could buy two: one for me, and one for my green-thumbed friend Sandra, who would successfully grow hers and give me a cutting when mine died. But alas, no. 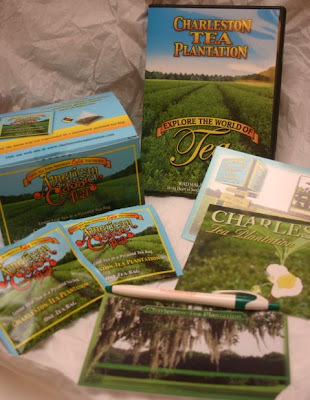 I did, however, leave with a sackful of goodies from the gift shop, and if you're not Charleston Tea Plantation-ed out yet, I'll share that tomorrow! My 2008 birthday season is now officially over (and thanks for all the nice b'day wishes! 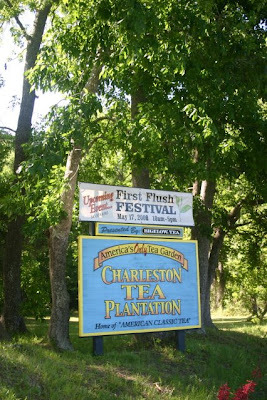 ), and the best gift of all came this weekend when my sweet husband indulged me with a trip to the Charleston Tea Plantation on Wadmalaw Island, S.C. for the First Flush Festival! You know it's a trip you've genuinely looked forward to when you do the tacky tourist thing and even roll down the car window just to get a picture of the entrance sign. I was amused to see the road sign (top photo) reading "American Classic Tea Ln." 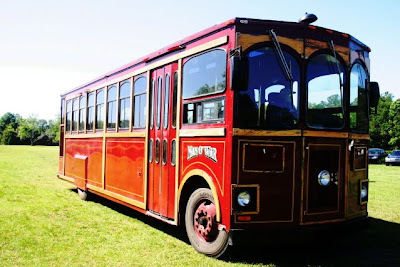 The tickets were ordered and received long ago (DH said he wanted to be sure they didn't sell out), and when we arrived we learned that for $5 more we could begin our day with a trolley tour of the tea fields. Of course we had to do that, and our guide was a nice gentleman with a good working knowledge of the Charleston Tea Plantation's operation and history. He was kind enough to even stop the trolley and allow me to snap some photos of the rows of tea plants. 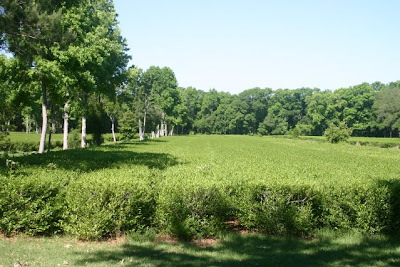 Suddenly, those two tea "hedges" I saw here in Georgia a few weeks ago didn't seem quite so impressive anymore! 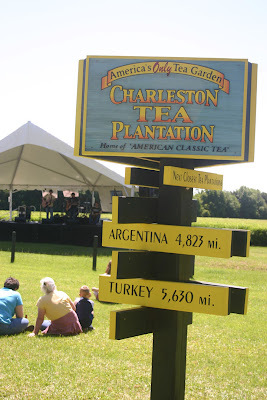 The Charleston Tea Plantation is about 127 acres. At other tea plantations around the world, workers pluck the leaves by hand. 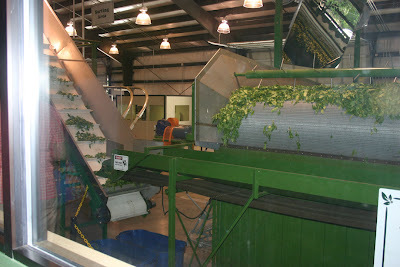 Here, they use a unique piece of harvesting machinery known as the "Green Giant." 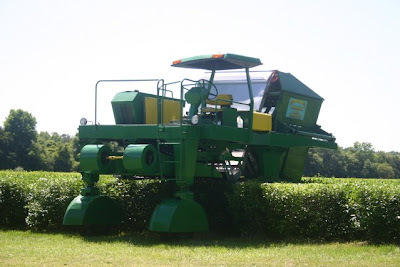 See how the business end of the machine rises over the top of the row? 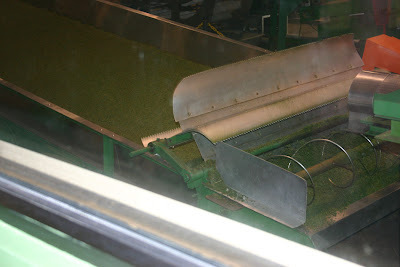 It uses a scissor-like cutting action to cut just the top few inches of new growth on the tea plants. On Festival Day on Saturday, all around the place were samples of this spring's "First Flush" of tea available to drink. And this tea really did taste especially fresh and delicious. That's enough for today, so drop by tomorrow and I'll wrap up this little mini-tour with a bit about how they manufacture the tea. And those of you who've been before, feel free to share your own impressions if you like! My local bookstore couldn't get it. Half.com and eBay didn't have it. Even the normally amazing Amazon.com didn't have it. 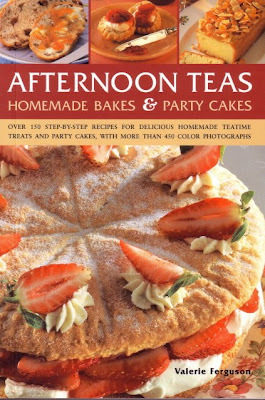 But apparently I had asked the good people at Amazon to send an alert if this book from a publisher in London ever became available, and bless their hearts, they have made me the happy owner of "Afternoon Teas: Homemade Bakes & Party Cakes" by Valerie Ferguson. I first saw this book in a British publication about a year ago, and you know how that sometimes goes; it's not always so easy to locate a product whose home office is across the pond. 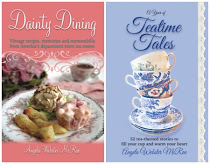 But this book really looked like a good one for tea enthusiasts, and I was so happy the morning I got the e-mail alert that it had become available. Classic Coffee & Tea? What on earth? 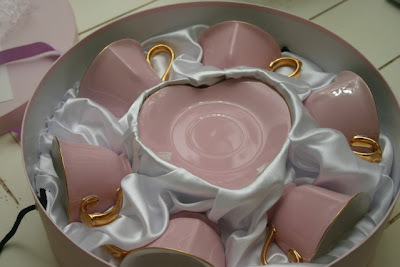 I opened it and found these six adorable pink heart-shaped teacups and saucers! Ashly is not only my friend but also my favorite shopping companion, because we both can "shop 'til we drop" and I know she can keep up with me while shopping. Ashly was with me when I spotted a floral heart-shaped cup and saucer last summer. She must have remembered how much I LOVED enjoying tea from a heart-shaped vessel, but I can't imagine how she found these when I looked and looked for months, online and in stores and even at a tea trade show, and never turned up anything nearly this wonderful. And I happened to have the perfect treat to enjoy with tea in these lovely new cups and saucers. Remember a few weeks ago when we were all coming up with words that end in -tea? Like Serenitea, Creativitea, Partea? Allow me to introduce you to this wonderful new Biscottea! 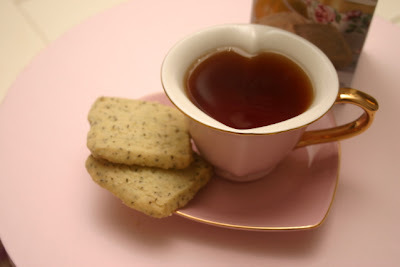 My husband laughed the other night as I oohed and aahed over the yummy flavor of this Earl Grey Tea Shortbread. 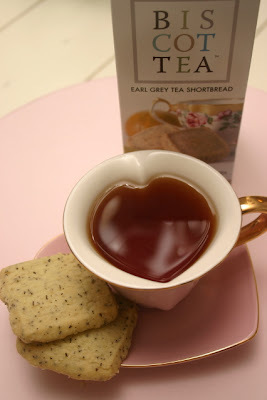 Now I love Earl Grey tea, and this cookie is packed with that flavor. Interestingly, the cookies ($3.99 at T.J. Maxx) are made with organic Darjeeling tea, not Earl Grey, but the bergamot flavoring sure makes it taste like Earl Grey. The cookies also come in other flavors - Blueberry Tea, Chai Tea, Mint Tea and African Honeybush Tea - so I'd love to hear if any of you have tried them. In reading other women's blogs, especially the crafty ones, I've noticed how often someone mentions finding something new at Michaels crafts store and using "my 40 percent off coupon." I'm pretty fond of those coupons too, but sometimes even 40 percent off isn't good enough. 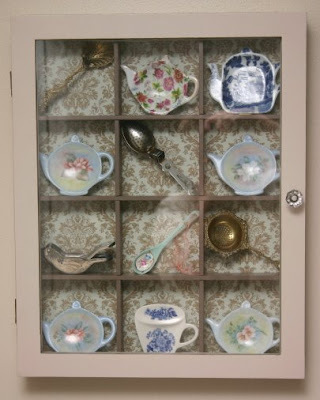 Like with this little display cabinet. I wasn't sure it would end up being very useful back home, but when I discovered it was 60 percent off the other day, I thought NOW we're talkin'! I'm not at all convinced this will be the final result, with tea bag rests, strainers, an infuser, a lemon bird and a cute teaspoon. Somewhere, I think I've stashed some of those tiny tea books that might fit. Maybe some pretty teabags? I've got a few of the flatter teapot Christmas ornaments that might fit, but I don't want to go plundering for those until closer to Christmas. 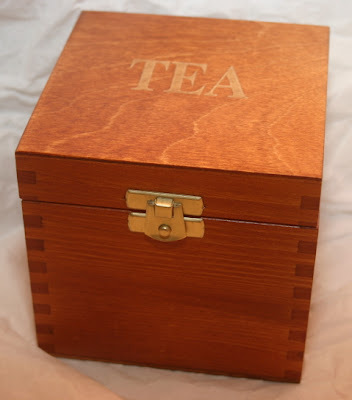 At any rate, if you've been wanting a little "tea cabinet" of your own, remember: 60 percent off. It doesn't get much better than that. Also at Michaels, I discovered the $1 bins - always a good place to look for tea party favors - currently have some cute Mary Engelbreit items with teapots on them. I got the notecards and a pad and pen set. I actually saw the notepad listed on eBay for about $3, plus $3 shipping, and it dawned on me the design was very similar to some things I'd seen at Michaels. Thus I made a trip and got the goodies you see here. Of course now I can't give these $1 treasures to any of the friends who read this tea blog because they'll know my shopping secret, but YOU can certainly load up while the price is right! 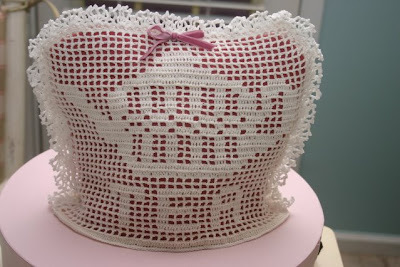 Suppose you were in the middle of a tea party and decided that the rose-scattered teapot you had, for unexplained reasons, perched on top of a pink hat box needed a tea cozy. What would you reach for? And suppose that after making precisely half of a filet crochet tea cozy about six years ago, you suddenly got a burst of energy and decided to make the other half and whip that baby right up. Wouldn't you want to put that tea cozy on the teapot? Especially if you had, say, finished it around midnight? Yes, I'm sure you would. I said all that to say this: Last night I finished this pattern called the Blue Bow Tea Cozy by Dot Drake (only mine is, of course, a Pink Bow Tea Cozy). The pattern is in the Spring 2002 issue of Fast & Fun Crochet magazine. I used pink felt to line it, and I wanted a more floppy bow up top and used a pinky/mauvy velvet. I'm actually very happy with how this turned out. And soon, I'll let you know why I'm so happy with what's in this new pink hat box as well! "Whether we consider the first primitive inn by the wayside, the sort of inn which, according to the parable of the Good Samaritan, afforded rest and refreshment to the stricken man brought to its door, or the smart motor inns of today, we find the connecting link in the word hospitality, which is the basis of inn-keeping. From the simple inn or tavern in which early settlers sought food and shelter for man and beast, to the great hotels, restaurants, cafeterias and tea houses of the present day, these establishments have ever been the gathering place of the leading spirits of hamlet, village, township, city and state." Several months ago, I was trolling eBay and came across a most intriguing listing. A seller was offering some booklets and memorabilia that had belonged to an Ohio tea room operator in the early 1930s, and I bought the lot of it. 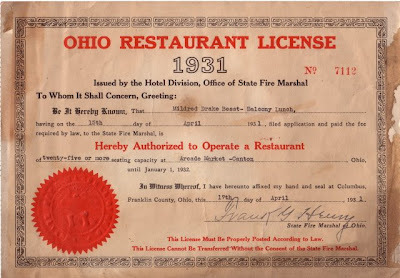 Mildred Drake Besst of Canton, Ohio appears to have taken the course to help prepare her to operate a tea room that was listed on Ohio restaurant licenses as "Balcony Lunch," "Balcony Lunch Room" and "Balcony Restaurant." Some of the checks and one restaurant license are in the name of Lillie V. Drake, who I'm guessing is the mother of Mildred Drake Besst. (And if anyone in Ohio knows otherwise, I'd love to hear the story!) 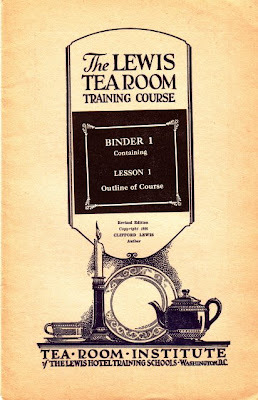 There are 14 "binders" from the Lewis Tea Room Training Course, which are really thin paperback booklets, and the correspondent was expected to complete a work sheet after studying the materials. Mildred got A's and was often told "Good Work." Here is a typical question: "Through what three things may 'atmosphere' of a food shop be created?" Mildred wrote: 1) Color scheme and decorations - interior and exterior. 2) Type of fixtures and surroundings. 3) Personality of the management. All of that still holds true today, doesn't it? Reading through all of this material gives an interesting portrait of tea room life in the 1930s, and also of the economic situation of the day. This check for $30.29 was to the Wade China Co. Wouldn't you love to know how much china that bought on June 30, 1931? And what did it look like? I was also intrigued that there are many checks to The Sanitary Milk Co. Whatever Mildred was serving up in that tea room, she certainly seems to have gone through quite a lot of milk. And I am having a lot of fun learning about it all! Flower ID, a Day at the Ritz & More!